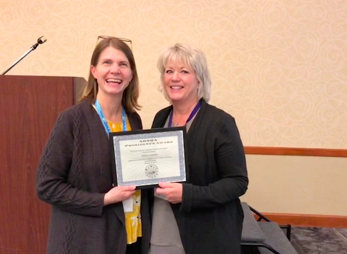 Andrea was nominated by Anna Spilker and Kelly Brewer based upon her clinical and leadership skills at Family Outreach Center for Understanding Special Needs (FOCUS) and in establishing her own private practice, It’s More Than Speech. Andrea’s particular area of interest and expertise is social communication. She has pursued extensive continuing education and self-study to gain knowledge and skills in this area, including attending the in-depth Provider Training for Michelle Garcia Winner’s Social Thinking Curriculum in San Jose. 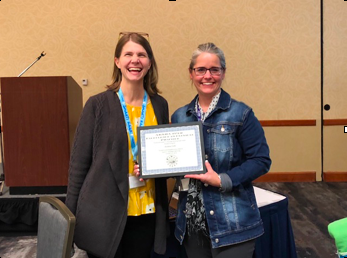 Additionally, Andrea is the Continuing Education Chair for AKSHA and facilitated an amazing 2018 Conference. Nancy was selected based on her advocacy efforts and communication with members about the Alaska Medicaid regulations changes, specifically Medicaid recoupment. As our ASHA State Advocate for Reimbursement (STAR), Nancy works tirelessly to advocate for our profession and reimbursement for services. Please be prepared to act on any upcoming requests for emails and/or letters to state representatives from Nancy. This is how we can bring about change as an association. Thank you for your efforts, Nancy!